A poetic reflection. 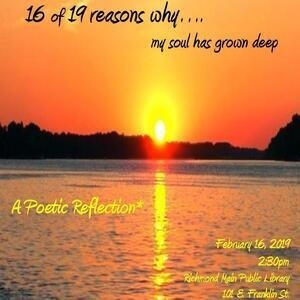 Poetry reading of poets from Harlem Renaissance to current contemplating the history and culture of African Americans from 1619 to now. Also poetry reading and spoken word performances on humanity, unity, peace, healing, struggle and human success. The poetry was excellent. The program overall was very engaging. What a worthy ensemble of artists. I truly enjoyed these performances with all of me! I was moved to tears and to laughter and to wisdom. This was healing for my spirit. I cannot wait for the next event. This was one of the most powerful performances ever! It was deep, moving and contributed truly a different story to this history of 400 years that touches the human soul. It was professional and exquisitely presented. It was worthwhile, entertaining and enlighting. It is an event I truly enjoyed attending. I was not surprised to see the room full and felt the standing ovation at the end with all the clapping and stomping was deserved. Plus the background pictures were all painted by famous African American artists and expertly matched with the poetry presented. Wonderful!! I got this circular link to post a review but I can't seem to get to the place to enter my comments. It was excellent! We enjoyed the variety and the spirit of each selection. I posted on my Face Book page already. Thanks for raising the bar for cultural expression in our community.